Social Media Today Creating Jobs for the Future! Thanks to social media, I expect that “Internet Profile Cleanup Expert” will be a profitable profession going forward, especially for those young enough that have accounts in high school or younger. Author DerekPosted on November 17, 2016 Format QuoteCategories General, Humor, TechnologyTags Facebook, Social Media, Technology, TwitterLeave a comment on Social Media Today Creating Jobs for the Future! â€œSocial media is over,â€ said James Franco at a recent nonprofit benefit. The actor and write received much attention for live tweets sent out during his co-hosting duties at the Oscars. However, after just a few months of being on Twitter, heâ€™s said that heâ€™s looking to spend less time on the service. Author DerekPosted on April 19, 2011 May 3, 2011 Categories General, Technology, WebsitesTags Best Buy, Facebook, Geek Squad, Social Media, Technology, Twelpforce, Twitter, WebsitesLeave a comment on Is Social Media Over? Author DerekPosted on December 23, 2010 Categories General, Technology, WebsitesTags Best Buy, Geek Squad, Twelpforce, Twitter1 Comment on I’m a Twelpforce Team Member, and so are you! It’s pretty obvious that Google’s biggest strength is their technology. It seems like every month involves some new Google technology meant to strengthen the company’s position as the Internet’s information phone book. On the other hand, as the company releases more and more products, I’m starting to see a small, but growing, backlash against their weakness: customer service. When Google’s product line consisted of “beta” products like Gmail or Google Maps, they could get away with providing very minimal customer service. Users with issues are often directed to an email address or forums for support. Now that Google is developing operating systems, like the Android platform on a growing number of smartphones such as their own Google-branded Nexus One, or the Chrome OS that they hope to have on netbooks, relying on email or forum support just isn’t going to cut it for potential buyers. Google is absolutely going to have to invest in more traditional customer service options, such as call centers, as their product families grow. 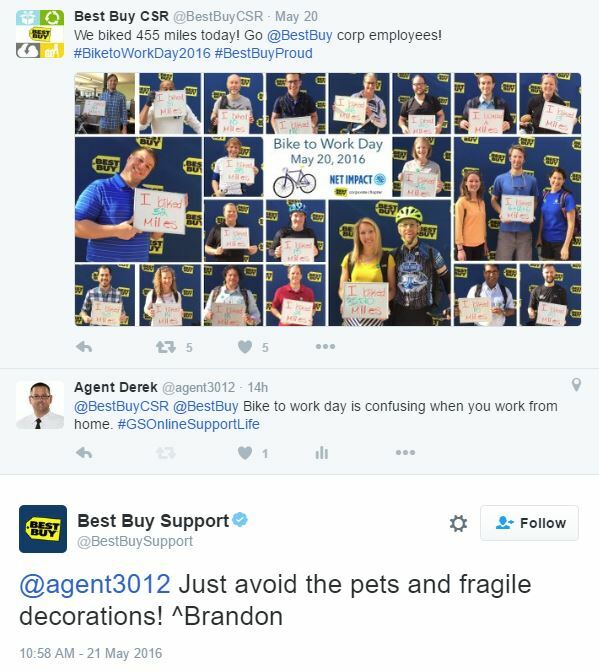 However, I also believe they’d also significantly benefit from looking at how Best Buy’s Twelpforce handles both customer service and technology questions. As a Best Buy employee who has helped a number of people via Twelpforce, I know very well how the model allows a company to use the collective knowledge of its employees to provide help to the public on a wide range of topics related to a company’s products and services. If there’s one thing Google is very strong in, it’s the technical knowledge of their employees. Imagine how many questions they could answer for the public by using a Twelpforce model to bring that knowledge straight to not only those asking the questions, but to anyone else who might have similar problems as well. Google wouldn’t have to rely on only Twitter as a means to answer those incoming questions either. Best Buy has been developing a tool alongside Twelpforce, called BBYFeed, that allows for both questions and answers that won’t fit within Twitter’s 140 characters. This tool is being designed to open up future avenues for both incoming and outgoing interactions beyond Twitter. If any company would be good at creating a way to collect those answers in a way that could be easily searched and available to answer future questions, it would be Google. So Google, where’s your Twelpforce?